Here is an activity that is quick to set up and practices fine motor skills and creativity. Having both a toddler (N is currently 17 months) and a preschooler (M is 4) means that there are plenty of times I need to find activities that are going to be appropriate for the two of them to work on together. 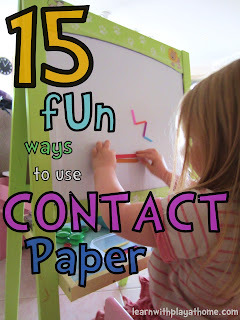 Enter the virtually mess-free activity, the contact paper sticky table. Materials: Contact Paper, sticky tape, craft sticks, cupcake liners and feathers. To set up, stick down your contact paper using the tape onto a flat surface (eg a table, window, easel, the floor etc) with the sticky side up. Here was our "Invitation to Play"
Having used this form of play a lot, Maddie dove straight in with a creative purpose in mind. Little N was less familiar and was content just making his hand stick and then pulling it off the contact paper for quite some time. He then started playing around and experimenting with sticking objects on while Maddie continued her creation, all the while telling us a story about what was happening. Everything about this colourful Invitation to Play was interesting to both children in different ways. Creative experiences offer a great opportunity for children to express themselves and practice and develop their vocabulary. I find that we have some of the best discussions when we're being creative. We left the contact paper on the table for the rest of the day and found that there were multiple times the children came back to it to rearrange or fiddle with the materials. Click on the pictures below to go to the posts. - Simplify this activity by providing large colourful items of different textures and materials for baby to manipulate with and stick on and pull off the table. You could even cover a baking tin or similar with contact paper so that baby can experience it while sitting on the floor. - Extend this activity by having children source their own materials under a given theme. For this you could ask children to create a garden and see what materials they find and use to portray this. Try different themes to see what they come up with. - Mix it up by providing any different materials that you'd like. Craft materials work great but even just some paper and scissors will provide a different challenge and skill set. Try adding some letters or numbers in for added literacy or numeracy learning. - Talk about the different types of materials that your child is experiencing. As little N played we talked about the colours, different textures, whether something was hard or soft etc. This is a great time to work on different vocabulary.